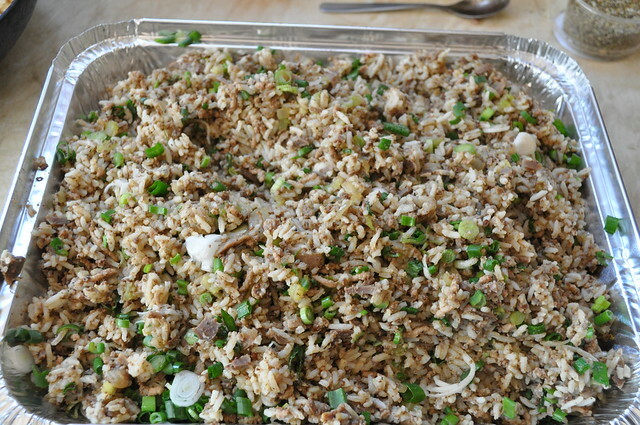 I’ll take the rice, and make it dirty..
For the Cajun BBQ cook-off, one of my contributions was Dirty Rice – a classic Cajun dish where rice is cooked with (amongst other ingredients) some minced chicken livers which makes the rice appear to be dirty – Hence Dirty Rice. Aside from being amused at how the Chinese woman got (what is essentially) a fried rice dish, I was delighted to be cooking a classic Cajun dish and hoped that it would measure up to the rest of the menu. Firstly, I decided to cook the rice first – It was to save a lot of time and I’m still slightly wary of cooking rice on the hob. So, the (long grain) rice was cooked in the rice cooker the night before so it was allowed to cool down completely overnight before it was required. I must admit, it was a bit strange to be cooking long grain rice in the rice cooker again (I only eat Thai Jasmine rice at home) but the smell was quite nostalgic for both YKL and myself. A nice dinner out with my Family and a good night’s sleep meant I was ready to tackle the rest of the dish the following morning. 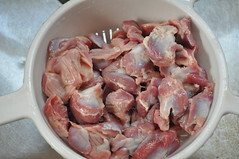 Now, handling chicken gizzards first thing in the morning isn’t really the most pleasant thing in the world for me to do – I’m only thankful that I wasn’t hungover in any way otherwise I would have struggled a bit. 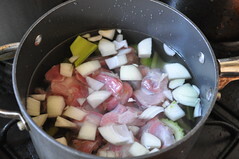 I couldn’t quite figure out if the gizzards had been prepared already of not, but in any case, I needed to cook them in some water with some celery and onion. 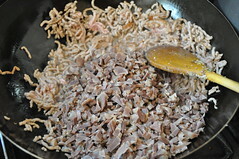 Brought to the boil then simmered until the gizzards are soft and tender, and the resulting broth is used in the dish later. Testing the gizzards after about 60mins, the meat was tender enough and it became clear that these gizzards had already been prepared so there was no need for YKL to help peel the tough outer membrane off. 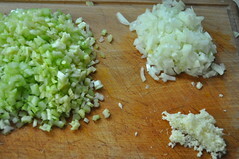 Whilst the gizzards were cooking, I got to preparing the rest of the ingredients for the dish; I finely chopped some celery, onion and garlic. 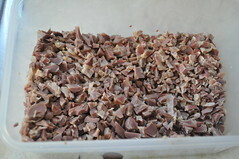 Once the gizzards had cooled down enough to handle them, they too were finely chopped and kept aside until required. 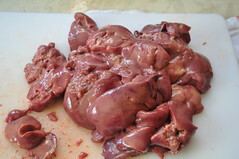 The chicken livers had any sinew and membrane removed before blurged in a food processor. With all the prep done, it was now time to cook the dish itself. Heat a pan, well a wok in my case, until smokingly hot. I got a bit carried away and let it smoke for a few minutes before adding the oil. 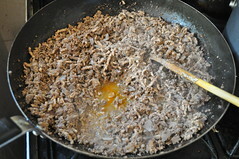 The pork mince was then added and broken up a bit so that it browned on all sides before the chopped gizzards were added to the pan and mixed in with the pork. 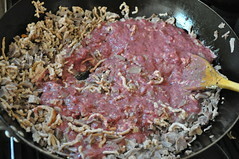 Give this mixture a couple more minutes before adding the blurged chicken livers – The pink of the livers against the brown of the pork mince and gizzards will be a bit shocking at first, but once everything is mixed together and the chicken livers cook, the uniform brown colour will return. 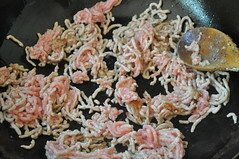 Season with salt, pepper and chilli powder and cook the mixture until it begins to stick to the pan. 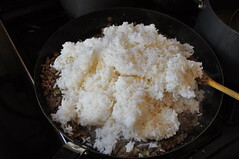 A word about seasoning here; You want to give the mixture bags of seasoning and flavour here as the idea is that the rice will absorb the flavours once added so don’t be shy when seasoning at this point. 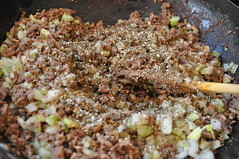 Add 1 ladle of stock and again, let them cook down until the mixture begins to stick to the pan again. At this point, the mixture will have gone from a pale brown to a deeper, mahogany with a slight red hue from the chilli powder. 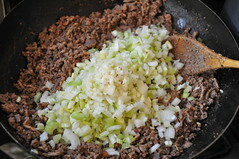 Add the chopped celery, onions and garlic and mix well until the vegetables are cooked through and (you guessed it), the whole mixture begins to stick to the pan again. I can’t stress how important this procedure is – You want it to get all crusty so add more depth to the final dish (without burning everything, of course!). 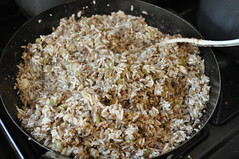 Add the rice and mix everything together with a couple more ladles of the broth. 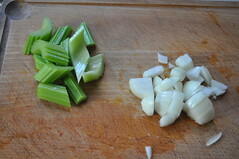 Sprinkle over some dried oregano and chopped spring onions and cook until all the broth has been absorbed by the rice. 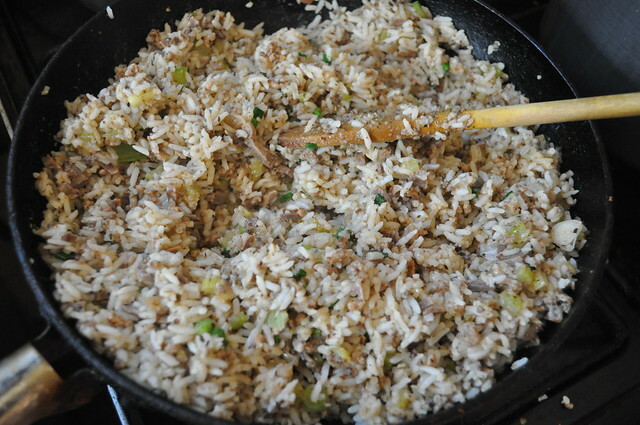 Taste to check for seasoning – adjusting if necessary, mix in some chopped spring onions and that’s it, Dirty Rice. 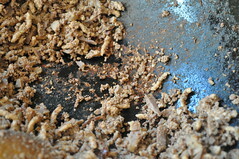 The resulting dish should almost have a grainy texture from the cooked liver, but the fact that it is so fine will mean that it’s not too liver-y. There was an intense flavour from the chicken gizzard broth, plus a slight crunch from the vegetables, mixed with the oregano and the slight kick of chilli at the end, it’s a nice accompaniment to the BBQ meats. Someone asked if there were beans in it and I’m not sure it would have worked texturally with the pork mince and the offal. 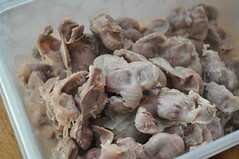 Tell you what though; It’s even better the following day when all the flavours have had a chance to develop. I think I’ll be making this one again – With or without a cook-off! 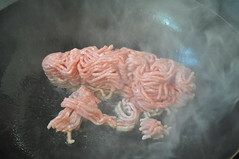 This entry was posted in Birmingham, Home Cooking on July 27, 2011 by YSL. Are you going to share the salad recipe too? The rice was better the next day, and the day after that too!